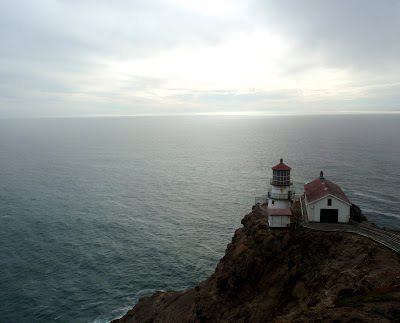 Made a quick stop at the visitors' center and were absolutely amazed to find out that there are only 10 National Seashore Protected areas, and Point Reyes is the only one on the West Coast. 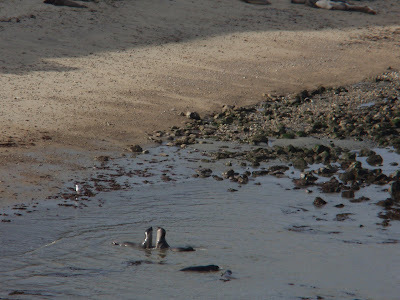 So much wildlife to see; so many birds, including gorgeous, graceful hawks, herds of elk, and tons of sealife. Tom stopped the car several times to see if we could catch the hawks on camera, it was a futile effort. Finally, after driving for what seemed like forever over rolling hills and through dairy farms, we made it to the Pt. Reyes Lighthouse parking lot. 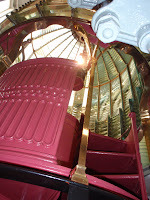 visitors' center at the top of the stair case that leads down to the lighthouse. 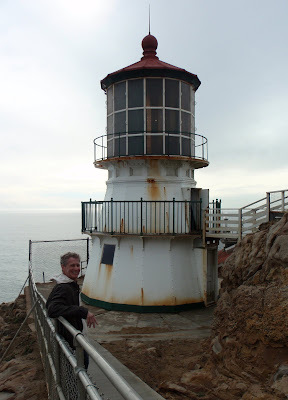 Enjoy the walk to the center, and the incredible views of the crashing Pacific Ocean! 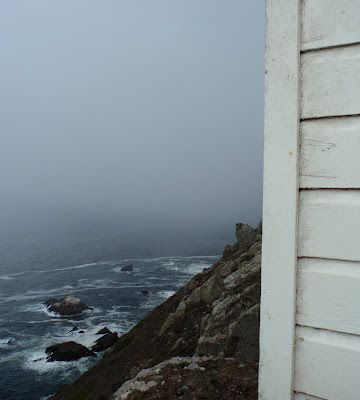 The day that we visited, the fog was extremely thick, almost a life of its' own - very eerie. 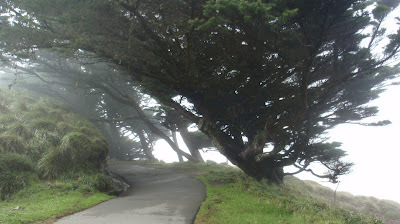 As we walked through this stand of wild wind-whipped trees, the fog dripped off like rain. Warning you now about the 308 stairs down, interspersed with long stretches of cement ramps, but thank goodness there are many view-point benches to stop and sit on the way back up! So worth the walk down though! Crashing waves and extensive 360 degree views of the Ocean. 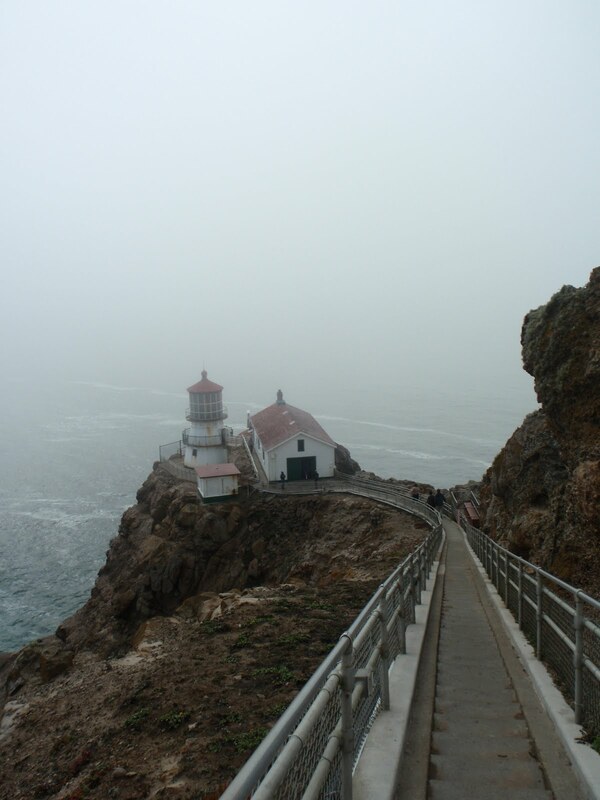 Point Reyes is the windiest spot on the Pacific Coast, and the second foggiest on the North American Continent. It was both the day that we visited! headlands at Point Reyes. 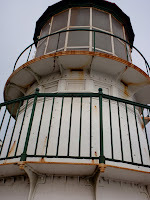 I cannot possibly imagine how hard life must have been for the first lightkeepers! Wind, rain, fog, boredom and hauling coal up and down this cliff to keep the light lit.. oh my, not so glamorous. Sounds like a wonderful trip. The view from the lighthouse is wonderful! Great photos...well done!